The Parrotspitze – a prominent peak in the Monte Rosa massif. The Parrotspitze is one of the independent 4,000-metre summits of the Monte Rosa Massif, with a prominence of 136 m. The prominence of a mountain is an important characteristic for determining whether it is independent. Seen from the west or east, the Parrotspitze is pyramid-shaped; seen from the north, it appears more like a hump. It is covered with old, granular snow, formed when crystals fuse into larger, hailstone-like particles as a result of melting and re-freezing. The mountain presents a very different appearance seen from the south: a sheer rock face. The summit was named by the Austrian general and surveyor Ludwig Freiherr von Welden in honour of the German doctor and scientist Johann Jakob Friedrich Wilhelm Parrot, a pioneer of alpinism. Another peak in Turkey is named after Parrot: the main summit of Ararat, said to be the mountain on which Noah’s Ark came to rest after the Flood, as told in the Old Testament. Parrot made the first ascent of this 5,137-metre peak on 9 October 1829. The doctor’s 1816 expedition to the Monte Rosa massif, however, was a failure. 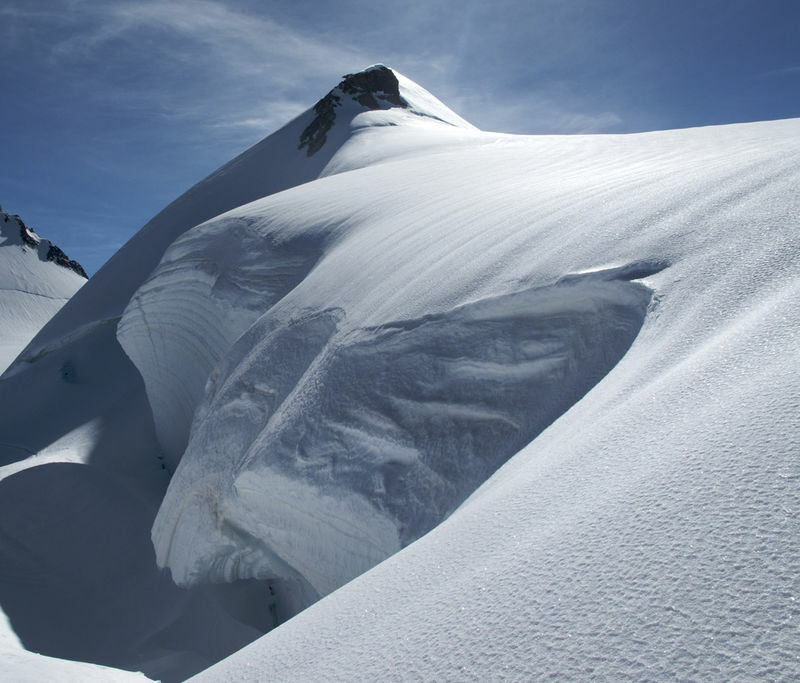 A first expedition up the Parrotspitze on 8 July 1862 by the British climbers Hereford Brooke, George and Adolphus Warburton Moore with the local mountain guides Christian Almer and Matthias Zumtaugwald led via the east face up to the final ridge, but turned back just below the summit. The second, successful, expedition on 16 August 1863, with Melchior Anderegg, Peter Perren, Reginald S. Macdonald, Florence Crauford Grove, Montagu Woodmass and William Edward Hall, led via the west ridge. This is now regarded as the standard route to the summit.